Posted on November 2, 2017	by H.P. Who could not hear a ravished daughter’s moan. With All Hallows’ Eve right around the corner, my coverage of The Horror Stories of Robert E. Howard draws to a close. You can find my previous posts here and here. This post covers the final third of the book. 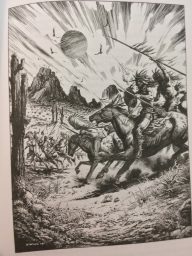 So now that I’m done, how does Robert E. Howard’s horror measure up? The first question to ask: measure up to what? I am woefully underread in horror. I would take Robert E. Howard’s horror over the Stephen King I’ve read. But I haven’t read Edgar Alan Poe since high school, and I haven’t read H.P. Lovecraft at all. I read The Turning of the Screw a few years ago, and it bored me to tears. I’m hardly the best judge of horror. It has never grabbed me as a genre. But I did love these stories. I particularly loved Howard’s weird westerns, and the introductions to Solomon Kane and Bran Mak Morn have me excited to grab those collections. None of these alone will supplant Conan for me (yet), but this collection shows Howard undeniably had serious range as a writer. Once again, the highlights are the weird westerns. There are three in this section of the book—The Man on the Ground, Old Garfield’s Heart, and The Dead Remember—and all three are tremendous yarns. Howard was just much better when he was playing in his sandbox instead of in Lovecraft’s. This section of the book also contains a pretty good barbarian, sword and sorcery story, The House of Arabu. The Hoofed Thing, like Howard’s Conan story Beyond the Black River, gives a prominent role to a heroic dog. In the comments to my first post, Paul Lucas mentioned Black Canaan, a story he characterized as “the most racist short story I have ever read, but also one of the most effective short stories.” I hadn’t read it at the time. As to the first assertion, I can’t agree, even if I only look at stories from this collection. The racial politics are baked into the story, but that will be true of any story set in the rural Deep South in the decades after the Civil War, at least if it is written with any realism. The surface level stuff like social structure and language isn’t jarring. But the really troubling attitude comes up in some of his other stories, particularly The Children of the Night. The racism of The Children of the Night isn’t the visceral racism of the rural South, but the erudite racism of well-educated 19th century American sophisticates. The story opens with Kirowan, Conrad, and four others casually discussing skull formation. Pseudo-science like phrenology would power the eugenics movement and be welcomed with open arms by the Progressive movement. Progressive hero Oliver Wendell Holmes would write what might be the most shocking statement ever laid down in a Supreme Court opinion when he rationalized that “three generations of imbeciles is enough” in giving a constitutional OK to forced sterilization of “mental defectives.” We’ve largely memory-holed it, but these were mainstream views—at least among our would-be aristocrats—until the horrors of the Third Reich put a spotlight on the natural end of that particular road. Howard, then, shows not just the prejudices of his geography but also those of his intellectual class. As to Lucas’ latter assertion, I wholeheartedly agree that Black Canaan is tremendously effective. It’s one of the longer stories in the collection, but I blew through it and it felt like quite a short story. Howard is masterful at slowly ratcheting up the tension throughout the tale. The entire thing is delightfully creepy. As Lucas notes, the role of race in the story makes it more effective as horror, not less. This is one reason while I’m leery of efforts to “reimagine” Lovecraft. If you excise the horrific aspect of a horror story, it isn’t really horror unless you add in something else horrific. And I don’t have to have read Lovecraft to think that his work is probably more effective as horror than as fantasy with tentacles. Alexandru Constantin on The Horror Stories of Robert E. Howard at Barbarian Book Club. Keith West on The Horror From the Mound, The Spirit of Tom Molyneaux, The Children of the Night, and Dig Me No Grave at Adventures Fantastic. Will Errickson on Pigeons from Hell and The Fire of Asshurbanipal at Too Much Horror Fiction. Ryan Harvey on Pigeons from Hell at Black Gate. Grandma’s Big Teeth on Howard’s “piney woods” stories. 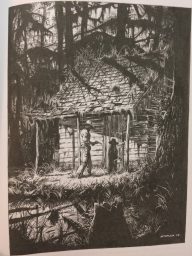 Throwback SF Thursday: The Horror Stories of Robert E. Howard, Part 3 was originally published at the Castalia House Blog. This entry was posted in Book Reviews, Horror, Throwback SF and tagged Robert E. Howard, Vintage SF. Bookmark the permalink. There are some great stories in that list. There really are. Like I said, this is a great second introduction to Howard after Conan.